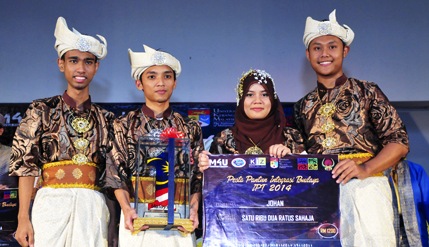 BANGI, 16 Mar 2014 – The team from the International Islamic University of Malaysia (UIAM) emerged champion in this year’s inter-varsity Pantun competition held at the Ibu Zain Residential College of The National University of Malaysia (UKM) here today. The team won the Championship Trophy, cash of RM1200 and other prizes. This is the third time that Ibu Zain College had hosted the competition organised jointly by the Dewan Bahasa dan Pustaka (DBP), 1M4U, Institute of the Malay World and Civilisation (ATMA) and the UKM Cultural Centre. Team A from University Technology MARA (UiTM) was judged as the first runner-up getting a cash prize of RM1000 and University Technology Malaysia (UTM) second runner-up with a prize of RM500. A UiTM participant Mohd Haziq was judged as the best pantun reciter getting a prize of RM200. Twelve teams from eight public and private institutions of higher learning including UKM took part in the competition. DBP Director-General Datuk Dr Awang Sariyan, speaking before the final round said the competition is aimed at encouraging pantuns among university students while instilling unity among them. The chief judge, Mohamad Shaidan, an editor from DBP said judging was based on language, content and performance. The prizes were presented by UKM’s Deputy Vice Chancellor (Student and Alumni Affairs), Professor Datin Noor Aziah Mohd Awal and Dr Awang Sariyan.